Set largely in the rugged but resplendent borderlands of Arizona and Sonora, Mexico - and ranging as far afield as the Israeli desert, the Sweden of his mother's youth, the Midway Atoll, and Hiroshima, Japan, on the 40th anniversary of the dropping of the atomic bomb, Simmons B. Buntin's second collection of poems, Bloom, gathers unexpected insight from our built and natural landscapes to blossom into poems of striking beauty and stunning realization. Shine, the book's first section, ranges from the violet light of the last night in Eden to a daughter's coming of age and desire. Flare, the second section, weaves from roadside wildflowers to an evening in SoHo to a mother's memory of Nazi bombers overhead before her own storied migrations to America. And Inflorescence, the final section, braids the experience of a daughter recovering from emergency surgery following a severe accident, with the slow and mesmerizing bloom or inflorescence of the yard's magnificent agave. In reading the poems of this finely crafted and lyrical book, you'll find that like the daughter releasing ladybugs in the poem 'Shower' the open room of your heart, too, will be filled with pure red joy. Simmons B. Buntin is the American author of one previous book of poems, Riverfall, published by Salmon Poetry in 2005. His award-winning poetry and prose have appeared in numerous North American and European journals and anthologies. He is the founding editor of the acclaimed international journal Terrain.org: A Journal of the Built & Natural Environments, for which he also writes a regular editorial. He is the recipient of the Colorado Artists Fellowship for Poetry, an Academy of American Poets prize, and grants by the Arizona Commission on the Arts and Tucson Pima Arts Council. He is an avid photographer, website designer, and all-around rabble-rouser who lives with his wife and two daughters in the Sonoran desert of southern Arizona. Catch up with him at www.SimmonsBuntin.com. the poem paused by the person you love. imps stealing moths at twilight. in all the exposed crevices of the world. I first came across Simmons Buntin’s poetry in early November 2008, when Verse Daily published online his poem, “Flare”. This is a short poem set in the evening, narrator aside a field of wild desert flowers as the night comes down, a poem that in a short five couplets addresses life, death, and rebirth through the lens of man considering nature. The poem starts “South of Arizona 86...” and that’s a clue to Buntin’s work. It takes you down dusty footpaths, calling to mind other vagrant first lines like Hunter S. Thompson’s famous opening: “We were somewhere around Barstow on the edge of the desert...” Buntin’s focus is remote, natural, reaching away from the overpopulated and chaotic world in which we live. Arizona 86 is a highway no more than 50 or 60 miles from the Mexico border, crossing the Tohono O’odham Indian reservation. This is a desert land of sage, saguaro, ocotillo, and any other flora than can withstand drought, thriving in the rarer rains. This is a man happy not just for nature but for the people he’s with, a shared love for the world and the luck to view it with family. It’s a poetry that’s perhaps a cross between the solitude and observation of Mary Oliver and the joy and cheer of Walt Whitman, revisiting themes of rebirth and ritual, gratitude and survival. There is mourning for parts of our world that have or are being destroyed: Hiroshima in the past, and today, albatross chicks choking on plastic on the Midway atoll. There is the guilt of a father taking his daughter hiking on a trail too difficult, getting lost, finally emerging to safety. Bloom is a book filled with scorpions and bees, cholla and mesquite, coral snakes and coyotes. It’s got the expected section of notes on the poems, but it also adds a glossary of terms—plants names and other definitions—the sign of a true naturalist at work. Buntin knows his Paintbrush from his Palo verde. I owe a debt of thanks to Simmons Buntin for Bloom, his second collection of poetry, because it was in reading this work that I began to understand how one can gracefully wrap themes together on the scale of a collection, keeping the recurring images evocative rather than repetitious. Buntin writes of mothers who are also grandmothers, sons who are fathers, and daughters who are like the blooms of the Sonoran desert that surrounds him. He writes of the flora and fauna of the desert without losing the layers of meaning tangled within his writing, which like his life is always nature within the context of family, family within the context of nature. This collection is a fine weave of many of Buntin's experiences with the desert's flowering life and his own daughters' growth and healing. The poems move in three acts from “Shine” to “Flare,” to “Inflorescence,” the long, segmented, concluding poem that chronicles his elder daughter's maturation in the face of a significant injury, and they are predominantly metaphoric, both in theme and in specific images ("The blood is like a cardinal // dropping feathers as it lifts"). Buntin intertwines his daughter’s healing with the towering-yet-dying agave stalk in the family yard in a manner that reflects the truth of their interrelationship in his life and mind. In an unguarded trio of poems that closes the first section of Bloom — “Cardinals, Sabino Canyon,” “Story,” and “Arc” — Buntin writes of the grittier and darker intimacies of connecting with nature, such as bare feet on boulders, the scraping of skin that spills blood on stone, animals that attack, and rivers that drown. Much of the collection brushes on death and danger, given how intricate the connection is between that and its themes. In this way, Bloom is very different from other poetry collections on nature and family; it does not glorify either without also embracing their darker realities of both and celebrating their complexity. The greatest gesture Buntin makes to this complexity of topic is the detailed glossary that follows the poetry, defining desert terms that appear in Bloom, from cholla, to saxifrage, and back around to chitinous. Initially, I thought a glossary would take away from the mystery of the language, but instead it serves to add meaning to the work without limiting it. Simmons B. Buntin’s second collection of poems masterfully weaves the landscape and plant life of the American Southwest into a personal language. The taxonomies readers encounter here possess none of the Linnaean tendencies toward destruction (although Buntin knows that language) but make us believe that redemption through naming is possible. Even the glossary Buntin provides at the end of the book borders on the mytho-poetic. Take for example his definition of “Creosote”: “A long-lived and airy shrub native to the Sonoran desert with small, waxy yellow-green leaves. The creosote releases a distinct aroma before rainstorms that is often referred to as ‘the smell of the desert.’” Buntin knows his place because it is his place, and the plants here take on a haunting totemic quality. Bloom is complex, melding personal tragedy and naturalistic archetypes. Take the final poem, “Inflorescence,” an eight-part mini-epic paralleling the recovery of the poet’s daughter after a “plunge through the plate window” at a friend’s house with the toppling death of an agave on the poet’s property. The girl in the poem does not die. She slowly recovers from her wounds. The agave does, but not before disseminating its tubular suckers, and passing itself on in the inflorescence of the poem’s title. Buntin is not sentimental; however, the metaphorical death in “Inflorescence” is the death of the sentimental father. It's hard to believe it has been more than five years since I reviewed Tucson-based poet Simmons Buntin's wonderful debut collection, Riverfall. A lot happened in the intervening years in Buntin's life. He embraced family life in a way few poets can manage—much less write about movingly—and his latest book, Bloom, published by Ireland's Salmon Poetry, uses the natural world as a metaphor for the tender bonds of domesticity, and vice versa. This is environmental verse that avoids every cliché of the genre, choosing instead to carve a path that lies somewhere between the easy narrative grace of Billy Collins and the rich, organic imagery of Mary Oliver. Bloom brings into sharp relief the awakening of a man, husband and father as he realizes that he and his loved ones are but sweet, fleeting dreams. This realization makes his wife and daughters, and the plants and animals around him, even more precious. Opening poem "Whether You Are Listening or You Are Reading" doesn't possess any real nature in it, yet it sets the tone. Buntin poetically renders the simple pleasure of reading at a table as his wife listens to the radio via earbuds, laughing at what she hears; meanwhile, their two little girls nap in another room. It's not a high-concept poem, sure, but Buntin wrings significant and eye-moistening meaning from the moment when the house is quiet except for the "burbling springs of laughter" and "the murmur of turning pages" while the kids are (finally) asleep. Anyone blessed with this kind of rare experience knows how blissful it is. "Shower," meanwhile, offers a literal explosion of insect life in the Buntin home. After an afternoon spent collecting ladybugs from the garden, his daughter unleashes the entirety of her little "bug house" indoors, where the poet's attention had remained frozen in the pages of a book of Irish verse; the room is suddenly showered in "pure red/joy." The relationship between art and nature is always a lopsided affair in Buntin's view, since nature always triumphs, always succeeds in dragging us back to the hard insight that, while great books are often worth reading, a great life is definitely worth living. That said, I am a fan of cynical, dark-minded (post-)Beatnik writers like Charles Bukowski and Denis Johnson, and there are instances when Buntin's writing seems too sentimental, at least to my taste. His relationship with nature, while deeply intellectual and profoundly spiritual, is rarely, if ever, physical. Halfway through the book, I longed to encounter a poem in which he actually hiked a trail or climbed a boulder (as his daughter does in "Arc") or did something other than gorgeously ponder the interrelated beauty of nature and family ("Desert Jazz") or the aesthetic beauty of his family in nature ("Bosque"). A few poems seem forced, too; for instance, a lyrical meditation on the anniversary of the atomic bombing of Hiroshima ("Drawing") seems better suited for another collection, and an odd William Carlos Williams tribute set thousands of miles away in SoHo doesn't have much in common with the exceptional, domestic-themed work that surrounds it. Of course, nature and family aren't always as enduring as Buntin's poetry suggests, but they can be. Bloom is breathtaking and a great improvement upon the awesome, abstract word-stew of his previous book. It's a new and exciting collection. Simmons B. Buntin’s second collection of poetry, Bloom, was recently released by Salmon Poetry. The book immediately brought me back to my introduction to Buntin’s work. We published his poem, “Desert Jazz,” here at Shaking this past April. I recall feeling a distinct pang deep inside my chest at the beauty in the playfulness of the daughter and the moment where the narrator realizes he is the culprit—his tradition of music is carried on to her. Bloom, like “Desert Jazz,” which is included in the collection, carries in this tradition and truly sings. Review: “BLOOM: From Salmon Poetry’s Simmons Buntin” : Examiner.com : September 27, 2011. Review by Cameron Conaway. An important part of being a writer is to surround yourself with people who understand your pursuit of the craft. These people can spark ideas, they can test your creativity. But, more importantly, they can understand you in a way that few can. I had the opportunity to attend graduate school with Simmons Buntin. This means I was able to see his skills as a writer, and to see his skills as a writer grow. But I saw something else about this guy: He’s so much more than a poet. His poetic skills – empathy, compassion, listening, awareness – infuse everything he does in life. He’s a man in the world with environmental passions, a man who listens to opposing views with openness and humility, a man who takes pride in being the best husband and father he can be. 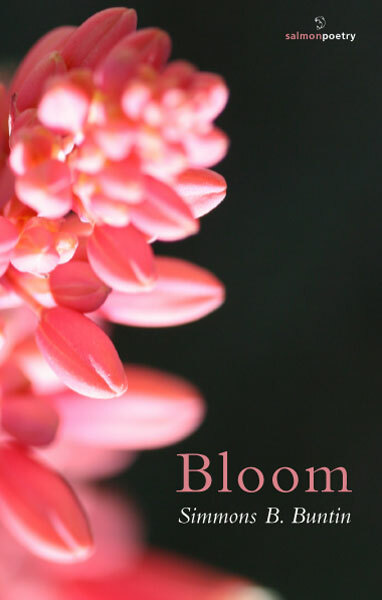 Simmons Buntin’s latest book—Bloom—has recently been released by Salmon Poetry. I highly recommend putting this book on your reading list, not only because it’s a good thought-provoking read and not only because it supports poetry, but because it supports a good person in this world who just so happens to be a talented poet.